What do parents do with an extra hour in the day and energetic kids who are four butterfingers and two snickers deep in their Halloween bags!? Chuck E. Cheese’s is here to help. The brand is offering one hour of free play with any purchase on Monday, Nov. 5 to help families with the time adjustment – a $20 value. Kids can play any game, as many times as they want, for an entire hour. We’re calling the offer Daylight Playing Time. 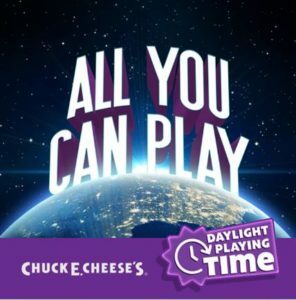 While this offer of free play for 60 minutes with any purchase is only on Nov. 5, families can enjoy this new way to play (playing unlimited games for a certain amount of time) every day, any day, with the brand’s recently launched All You Can Play… meaning less sticky, little fingers asking for more tokens and more fun and games! !